The name Malzoni is a reference in the Brazilian automotive and auto racing history. His cars became famous not only within the country, but also abroad. Some hundred units of the Puma GT were exported. Perhaps it reached the order of the thousands. The front-wheel drive models with DKW powertrain greatly impressed those who heard of them elsewhere. The Malzoni GT is officially considered a mark in the DKW’s history and, consequently, in the Auto Union’s (a.k.a Audi), the association of German manufacturers it belonged to. This acknowledgement became reality in November 2009, when one of the remaining units of this car was added to the collection of the Audi Museum in Ingolstadt, Germany. The metallic-blue Malzoni GT in display there was acquired in Brazil by Audi Tradition, the company’s division responsible for the brand’s history and of all Auto Union partners. It was restored before it was sent to Ingolstadt along with two other DKW models that were manufactured exclusively in Brazil by Vemag: a Fissore coupé and a last series 1967 Belcar (sedan), with a distinguished grille and four headlights. 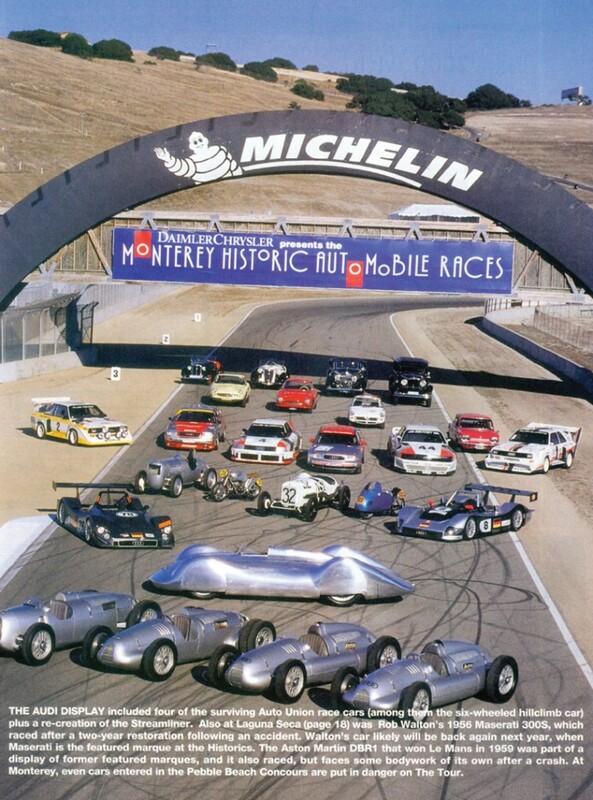 The Monterey Historic Races, held every year in the state of California, USA, are known worldwide for presenting at the Laguna Seca Raceway the world’s most prominent cars in auto racing history. Each year a different brand is honored and, in 1999, this distinction was granted to Auto Union. The stars of the event were, of course, the “Silver Arrows” from the 1930’s, when Auto Union competed with Mercedes-Benz for the world’s auto racing hegemony. Those cars innovated in technology, with their rear mounted engines between axles and other engineering features, developed under the command of no less than engineer Ferdinand Porsche. Without stealing the leading role, three Malzoni units also called the attention of the public, which, with very few exceptions, had never even heard about or seen the Brazilian GT. Two of them were racing models: a yellow one, owned by journalist and collector Boris Feldman, from Minas Gerais and a white unit owned by Eduardo Pessoa de Mello, from São Paulo, then President of the Auto Union DKW Clube do Brasil. The third, a street version, belonged to Paulo Lomba, who eventually sold it to Kiko Malzoni. Pessoa de Mello’s car was later sold to Paulo Malzoni, Rino’s nephew. Malzoni GT Type IV, participant of the races held at the legendary racetrack of Laguna Seca, in the United States. The trip to the United States was sponsored by Senna Import, responsible, at the time, for the importation and success of Audi cars in Brazil. During the three days the event lasted, two of the cars, driven by Feldman and Pessoa de Mello showed their sports qualities at the challenging Laguna Seca circuit. Lomba’s car could not enter the track as it had no safety equipment. The event’s official picture, taken at the track’s finishing line, shows a little more than thirty cars, the most significant models in Auto Union history. The Malzoni GT was among them.